Within these first pages we’d on her side as she battles through the sheer hillside of snow, carried forward by determination and the knowledge that if she stops, she’ll fall. It’s a perilous situation, and by the time she reaches the top, black dots are flooding her vision though exhaustion. It’s then that she meets the bear, a hibernating grizzly with a wounded shoulder and a cold space where her cubs should be nestled. The novel is written in three voices, and essential on three planes – the commonplace, everyday world (be it surrounded by wilderness), shared in Darcy’s voice; a more abstract, almost third person viewpoint, also in Darcy’s voice, but with a far broader view, which occurs when her weariness causes her to drift free from her body, and an omniscient voice sharing the bear’s raw feelings and experiences. It seems complicated, and yet, in Mimi Thebo’s confident hands, it’s actually the most straightforward thing. It takes a skilful author to make you accept the more improbable aspects of this tale. Darcy’s own pragmatic nature helps with this, as she berates herself for taking risks, and then takes more, because she isn’t sure what else to do. Darcy is one of the strongest characters I’ve met in fiction – however weak her body is, she finds a way to achieve her goals, mainly of getting food to her bear. Some of this is gruesome, involving half-rotten, half-frozen winter kills, but Mimi always keeps humour close to hand. The image of a bear trying to eat its first cantaloupe melon will stay with me, as will the thought of the protocol Darcy and her family follow when a storm hits and the power goes down. Real people are living in conditions likes this in Yellowstone Park, finding ways to stay warm when temperatures drop and visibility is reduced to pretty much zero. Mimi also manages to maintain Darcy’s character as a teenage girl, so that when she heads out of the park into town we’re treated to a paragraph of her fretting over what to wear – entirely believable and relatable. Her excitement at finally making contact with her UK friends is as palpable as her growing connection with the bear, which ensures the ending is all the more moving. And even when the worst happens, Mimi manages to insert a moment of reprieve that leads to one of the most empowering last lines I’ve read. 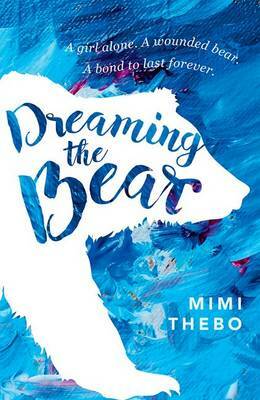 Dreaming the Bear by Mimi Thebo is published by Oxford University Press and is available to buy from Amazon. This entry was posted in Reviews and tagged Book reviews, children's fiction, Dreaming the Bear, Mimi Thebo by Judy. Bookmark the permalink.